It is quite difficult to answer these questions and understand the results using tables or charts. That's why CleverAnalytics allows you to actually visualize relationship among polygons within the most intuitive context: on a map. We bring you easy-to-use and friendly map-visualization where you can explore migration, transportation, and commuting patterns – factors that every modern business should be considering in order to grow their customer base. How to visualize the data about migration, people movement, flights, or transportation? 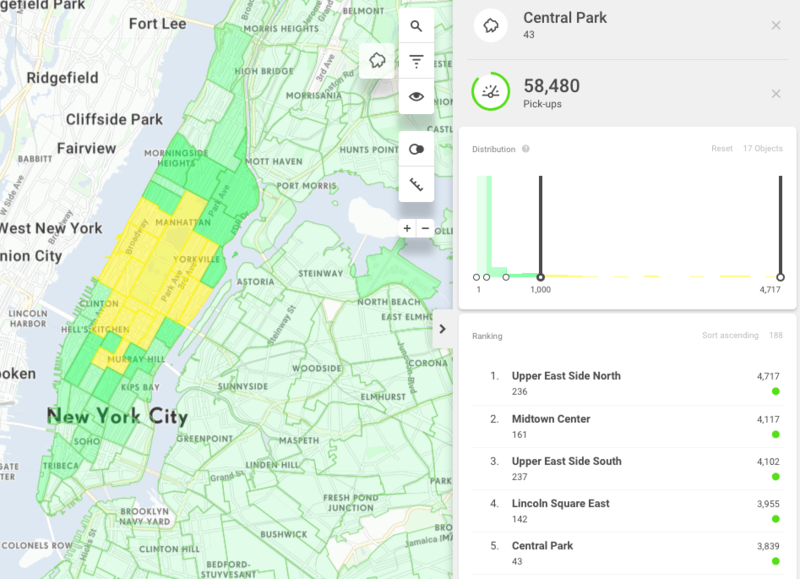 Let's demonstrate how it works on sample data about taxi rides in New York. In the data, there is information about which zones passengers were picked up and dropped off. This, coupled with the data about the cost of the service, how many passengers were transported, and when the rides happened give taxi companies extremely valuable information about how to strengthen their business. Using CleverAnalytics you can dig through data using the interactive map and infopanel. You can display taxi rides and select any taxi zone from the map to find out how many rides starts in it and which zones these rides ended in. Hovering over zones in the map will display a tooltip which shows how many rides that started in the selected zone ended in the hovered-over zone. You can see that from 58,480 taxi rides that started in Central Park 3,839 also ended here. What struck us the most was the fact that there are less taxi rides from the suburbs to the city center in New York. And also that people use taxis for short distances inside Manhattan. What about to evaluate taxi rides from and to New York City airports? Explore our NYC Yellow Taxi demo and let us know what you are able to figure out! Would you like to visualize your own data using CleverAnalytics and relationship among polygons? Create your own project for free and show off with that project on Twitter or Facebook using hashtag #CleverAnalyticsMaps. Refer to our Help Center for further details and enjoy exploring the wonderful world of spatial data with CleverAnalytics!